Police found a 2-year-old boy unresponsive in a hot car outside a bar after his parents reportedly left him behind while they went inside to have a drink. According to WPXI in Pittsburgh, the toddler was in his car seat “slumped over, sweating and unresponsive” when officials arrived. The car was locked and its windows were cracked, but that wasn’t enough to alleviate the temperature, which was a smoldering 80 degrees that night. The news station reports that the mother, Terri Hymes, attempted to make a getaway by trying to jump into the car after police confronted her. “As police gathered outside the vehicle waiting for medics to arrive, the mother exited the bar and attempted to get in the car and drive away,” the criminal complaint stated, according to WPXI. Shortly after, Archie Howard, reportedly the stepfather, exited the bar and caused a disturbance by raising his voice and failing to obey police orders, according to the news station. 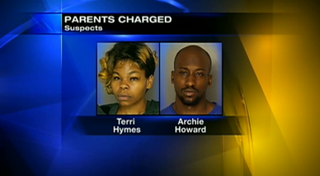 Both Hymes and Howard were apprehended and taken to the Allegheny County Jail. Hymes on Wednesday was facing felony child-endangerment charges, while Howard faced misdemeanor child-endangerment charges. In addition, both were facing public-intoxication and disorderly conduct charges, according to WPXI. “These kinds of issues that involve children really pull at [police officers’] emotions a lot,” Pittsburgh police spokeswoman Sonya Toler told the news station. The child was treated after the incident and was in the custody of the Pennsylvania Office of Children, Youth and Families, according to WPXI.